The car donation process sounds so simple: Donate your used vehicle to charity and receive a tax deduction while you help those in need. It’s a win-win situation, right? Not necessarily. Without a little planning and preparation, it can be easy for well-meaning donors like you to end up stumbling and fumbling with deductions come tax time. 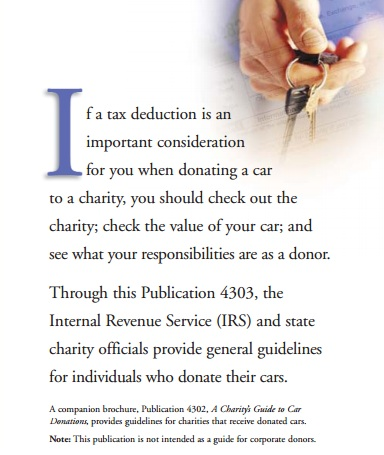 The Internal Revenue Service (IRS) requires people who want to donate a car in NY to calculate their tax deduction based on how the charity utilizes the donation. Tax deduction for car donations are generally limited to the sales price, however, the car’s fair market value (FMV) may also be used. In line with this, the IRS also provides the following tips to help you maximize the tax savings of your donation. If you are eligible to deduct charitable contributions for federal income tax purposes and you want to claim a deduction for donating your car to charity, then you should make certain that the charity is a qualified organization. Otherwise, your donation will not be tax deductible. Some fundraisers have mistakenly claimed that donors can, in all cases, deduct the full value of their cars as found in a used car guide. A used car guide may be a good starting point to value your car, but you should exercise caution. The IRS will only allow a deduction for the fair market value of the car, which may be substantially less than the “blue book” value if the car is donated to charity and used by the charity but not sold to raise funds for the charity. You can check the IRS’s Cumulative List of Organizations for qualified charities. It is important to note that this list doesn’t include religious organizations, although they do qualify. If you’re still undecided, you can consult a trusted vehicle donation service like Miles Ahead Network to make sure you work with a qualified charity and get the tax deduction you’re hoping for. Yes, it CAN be a win-win situation. It’s often said that the biggest winner in a car donation transaction is the recipient and not the donor; however, if you take the time to do some research and find a reputable car donations processing service to work with before you donate a car in NY, you can also emerge victorious. This is because leading processors ensure that they maximize the sale price of your vehicle, as well as guarantee that the highest dollar amount will be donated to your chosen charity.